German Shepherd ear taping is something that many GSD puppy owners do not take seriously until it is much too late. 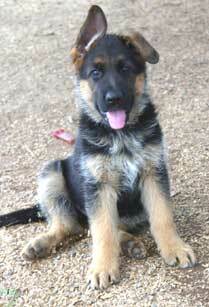 German Shepherd puppy ears can come up on their ownanytime between 8 weeks and 6 months . Before we get started, let me take the time to tell you right now that NOT ALL German Shepherd puppies will have to have their ears taped up - but many may need the extra help of this process. So for those who need the extra help, here's how to do it. Puppy ear taping is often an important procedure in the development of the GSD puppy ear carriage for GSD with weak ear carriage. If the GSD puppy ears are not up by 4 months I suggest that you get very interested in your German Shepherd puppies ears and getting to know the whole German Shepherd ear taping process very well because they may have to do it soon. One suggestion: help stimulate your GSD puppy to use their ear muscles to help bring their ears up faster naturally (not through touch of that tender ear tissue) by making interesting noises, and sounds, etc. to cause the puppy to use those maturing ears and to stand them up on their own. It is not yet time to panic, however, it is time to sit up and take notice. When the German Shepherd puppy ears are taped after 7 or 8 months old it has very little chance of working. German Shepherd ear taping is an important process that does not need to be done with all German Shepherd puppies, but some Alsatian puppies do need the extra help. The process of teething in general takes valuable calcium from the German Shepherd puppies developing ear structure to those developing teeth and that is one good explanation for the whole process of GSD puppy ears being up one day, and then down the next. Some GSD puppy ears stand but will jiggle at the top tips when the dog runs. This is often called "friendly ears" and is not considered a desirable trait in GSD ear carriage either. It is very common for GSD pups to have ears that tilt and flop this way and that as they gain strength to stand on their own. The German Shepherd ears may take all matter of shapes (1 up, 1 down; 1 this way, 1 that way) until they come completely up on their own. Do not panic when this happens to your German Shepherd puppy. It is completely normal. The German Shepherd ear taping process will help take care of this to get the ears to stand erect on their own. I don't suggest that any Alsatian puppy owners rub their GSD puppies ears backwards away from the tip of its nose or to scrunch them up in their hands when petting the dog. Since the musculature in the GSD puppies ear is just now developing, you don't want to do anything to disturb that new ear development. If you were to scratch the pups ear at its base (where it attaches to the skull) the puppy will enjoy it just as much and you will not disturb that developing ear structure in any way. If you have questions about the German Shepherd ear taping process, feel free to contact your German Shepherd breeder, a local GSD breed club in your area or your local veterinarian. First you'll need to buy the large pink (they come in many colors) spongy perm rollers (Goody's ¨ is the brand I use) from Wal-mart, CVS, etc., for the German Shepherd ear taping process. Take out the hard plastic clip out of the middle of each roller and discard it. You do not need that hard rubber/plastic section of the roller mechanism - throw it away. You only need to keep the spongy pink foam roller part. Smaller pipe insulation tubing, Grey, I believe, from Home Depot works as well if you can't find the pink foam rollers as long as it is the same diameter as the Goody's ¨ sponge rollers. You will have to cut this pipe insulation to length, while the pink rollers are already the correct length to start and they (the pink rollers) are also the best and easiest to use in my experience, and often the easiest to find, overall. Use the pink rollers if you have the chance. • At your local drug store purchase the thin white surgical tape (the kind that's paper thin and tears easily). The 3M Micropore tape, 2" wide works well. Your pharmacist can help you find this if you have any questions. NEVER EVER even consider using any tape such as duct tape, electrical tape or the like for the German Shepherd ear taping process! Plain masking tape like you find in the paint section of a hardware store is an alternative often used as well for this process since it does not have such a terrific adhesive property like many tapes do. If you don't have the right kind of tape it will do more damage on the developing GSD puppies ears than good, so wait and get the correct supplies first before attempting to do this. • You'll also need one UN-sharpened pencil to use in the German Shepherd ear taping process, if you decide to use the glue taping process. Eyelash Glue is another alternative to use in place of the skin bond adhesive. First, insert the pencil (unsharpened end) into the pink foam roller about an inch or so to make it easier for you to hold later on. Next, put the Skin Bond on the pink foam roller about 3/4's of the way around the roller, so it is well covered but not oozing or dripping off the roller in any way. Important: You do not want the glue to drip off the roller into your pups ear canal when ear taping your GSD puppies ears. You do not want to get the glue on your hands either while in the middle of this process. That is where the pencil comes in - to help you hold the roller steady while applying the skin bond adhesive to it. Optional step: If you decide not to use glue for some reason, you can cover the sponge roller all over with an adhesive tape such as a masking tape or surgical tape (with the sticky side facing outward) in place of the glue. While holding the pencil end of the sponge roller device, wrap the GSD puppies ear around the glued / taped foam roller and then tape them into a fairly firm roll (but not too tight), in an upright position. Next, remove the pencil from the sponge roller by gently pulling it out from the top. Do NOT leave the pencil in after taping is complete! It is important to place the roller inside the German Shepherd's ear flap itself near the bottom half of the ear flap, leaving about a two finger's worth of opening above the German Shepherd puppies head and the bottom of the roller inside the ear flap. Do not completely block the ear canal with the roller when ear taping the German Shepherd puppy. 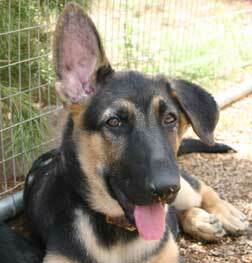 The German Shepherd puppy will still need to hear with the roller inside its ear flaps. Optional: Some people take a popsicle stick and attach it to the top part of both of the GSD puppy ears in a horizontal position after taping the ears. I have never tried this method myself. The key to this step is to continue retaping the ears as soon as it gets torn down, and this is also true especially if you opt to use the full taping method (described above) as opposed to the glue/tape method. It is thought that eventually the GSD puppy will forget about the tape all together and leave the ears alone. Now, distract the GSD puppy with food or by playing ball, or maybe even a mini obedience lesson, for about five minutes or so until the glue / tape has time to set once the process is complete. The roller will fall out on it's own in about a week or so if not taken out by you or by your your German Shepherd puppy ahead of time. Continue the re-taping process as needed until the German Shepherd puppy ears stand on their own. Optional: Detachol Adhesive Remover is used to remove tapes, bandages and, of course, Liquid Adhesive. Important: If the German Shepherd puppy ears are not up by 7 or 8 months of age they are probably not going to come up on their own. When the GSD ears do not stand on their own there are ear implants that can be surgically added. I have no experience with this personally but if you have a German Shepherd whose ears will not stand on their own, this is a potential option. Check with your vet or GSD breeder with any additional questions you may have concerning the German Shepherd ear taping process. Downed German Shepherd ears are not the end of the world, however, erect ears are a part of the German Shepherd Dog breed standard. Some GSD pups ears will simply never stand. This is known as a "soft ear". Upright ears are not only healthier overall for the dog, but more so, they are handsome and again, part of the breed standard, and also the way the German Shepherd was bred to look.